We're happy to report that phase one of our top navigation redesign testing went very well. We're going to be starting phase two very soon, and wanted to give you a preview of things to come and some details about the test. Wait, why users with 499 rep or less? That's a darn good question and I'm glad you asked. As you'll note, we've combined both top navigation bars into one, which presented quite a challenge! We're almost done making sure the nav works nicely for users with access to review and things that you see with even higher rep levels (including moderator access), but there's still a tiny bit of work to be done. Restricting the test to users with less than 500 rep allows us to test the majority of functionality while we finish up the last few bits. When does the test begin, how long will it last? Under ideal circumstances the test will run 1 - 3 weeks, but it's hard to predict this without seeing at least some data from the test. We're reasonably confident that we're not going to cause any unintentional effects on user behavior (e.g. users clicking at random parts of the screen we didn't anticipate), but we can't be sure until we see some data. If more tweaks and iterations are required, the test will need to run longer; we'll keep you posted if that's the case. I have 500+ rep and I want to play too! You'll be able to, don't worry! Once this test is done we'll probably be in rather good shape when it comes to the more complex cases (e.g. you're a moderator and currently see lots of special stuff up top on the existing nav). Higher rep users will be able to opt in to test by enabling it in the preferences section of their profile. Can you give us a vague idea of how it would look for higher rep users? Since high rep users don't typically need the help link visible all of the time, we'll be changing it to an ellipsis that opens a menu with shortcuts to the things higher rep users have access to. Counters (such as flags / review) will become visible pretty much the way they do now. There might be a small heads-up-display for moderators in the right sidebar with more information that matters to them, along with convenient links to get to common tools. All of this is still being worked on and is very much up in the air. I have a question, a comment, and if it's Friday I also have a haiku. Leave a comment or answer and we'll do our best to help! If you have a haiku and need a reply, try to leave a hint to that effect. Alpha testing of this is now enabled, so you'll see it if you selected the new header option under the 'preferences' menu from your profile. Please add a dark theme, this is so bright it hurts my eyes. If that's not possible please introduce a little color to reduce the amount of white on the page. It's pretty atrocious at the moment and makes the site hard to use. A reminder that in general users see shapes rather than reading words. The new design makes it harder to distinguish things. I've never seen a search field on the middle of the screen. It's either at the right side, on a corner using as little horizontal space as possible, or on the left using as much horizontal space as possible. I don't think the users are going to find the search field easily. It's sticky. It wastes valuable vertical space. I'd appreciate such approach if I used 24" vertically aligned display and not the 15" laptop. In addition to stickiness, it is too tall. Font size doesn't match such height. Most of the buttons are rarely used. I do not understand the reason behind making them always visible. Font and badge colors do not match with white background. They are too bright, nearly indistinguishable from the white background. Unpin the navigation bar. The usable part of my 1280x800 13" screen is already small enough normally (after system menu bar/taskbar, browser controls, browser tab strip, etc). It doesn't need to be visible at all times and it's definitely not worth the space. 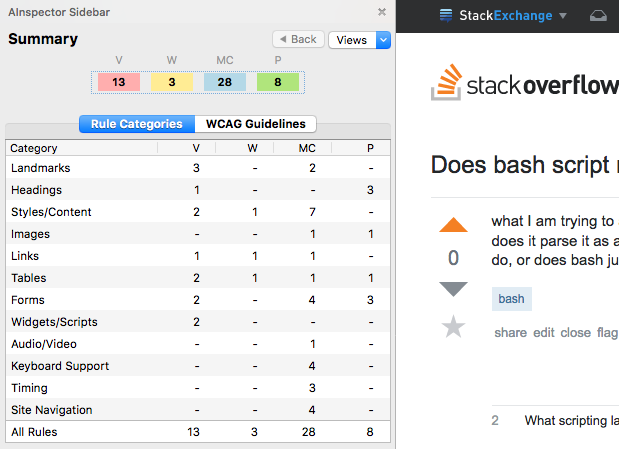 These are from AInspector Sidebar, but there are many compliance checking tools. I don't use the Jobs and Documentation tabs but do use the Badges and Ask Question tabs. On the new header the first two have been given a much, much bigger precedence to features not everyone users. And the others seem to have disappeared completely. So basically I think these two shouldn't be striking you in the face but scaled down and then you could fit more tabs on that are used, at least by me. Also I can't see where the help menu has disappeared to, unless it is the tiny question mark icon. Something as important as help, that we really want all users to read, shouldn't be hidden behind an icon. Will it be possible to hide buttons/tabs/whatever-you-want-to-call-them in this new nav? I don't use Documentation, I rarely look at Jobs, and I don't see much use for Users. Obviously, I can do this with a user script, but it would be nice to have it built in. Not sure if it's a screen size issue (using a 13-inch MBP), but the top navigation is now covering the top content on the recent questions pages for me. And while trying to add this image I also just noticed that uploading an image does not work on this screen size as the bottom of the upload box is cut off. So you guys definitely have some responsiveness work to do. I have >500 rep and ended up with the new design. I can't find the "review" button here. Does it have it? Has there been a mistake? DO NOT force focus into text boxes (like happens with the "Type to find tags:" box on the "Tags" page). It breaks navigating back/forwards with Command-arrows in Safari (and maybe other browsers too), and it also breaks scrolling with arrows and spacebar. Once there is being a whole redesign, can you please make the logout button visible! I can't find the logout button! Where is the Sign out link? I'm surprised that no one made an answer for this even though it was mentioned several times in comments. Is it possible to add a little contrast to the top nav? Doesn't have to be much but maybe add just a bit of gray. That will help make it stand out from the white of the page background. Especially since the nav is now fixed to the top of the viewport so it will be hard to distinguish when you scroll down. Where will reputation changes appear on this new header? In the trophy tab? Or will they be lumped in with post/comment notifications? Neither one seems thematically appropriate compared to the existing graph icon. I'm interested to know... what kind of user testing did you do that led you to believe a trophy icon was a good indicator for privileges and numerical iterations? I know it isn't Friday quite yet, but it was such an open invitation. My screen width is not the average monitor, and using $(window).width() yields 1007. Will this cause the new design of the top bar to side scroll or have content overlap with itself? Putting the least frequently used stuff to the left and the most frequently used to the far right is a really expletive idea. Just sayin`. Overall, hate the change. Looks like mostly "fixing" things that weren't broken and making other things worse in the process. I haven't seen it live so am basing this on your image, but... did you really put an essential navigation control all the way over to the right, on a site with a design that is not responsive to browser window size? With this design, would my choices be to either have a 1300px-wide window (so much for that tablet) or scroll horizontally every time I want to use the most important part of the top bar? Please remember that we are not all using large high-res displays, and that some of us have other reasons not to use super-wide windows (legibility of normal text, wanting to put browser and code windows side by side, poor vision requiring bigger pixels, etc). 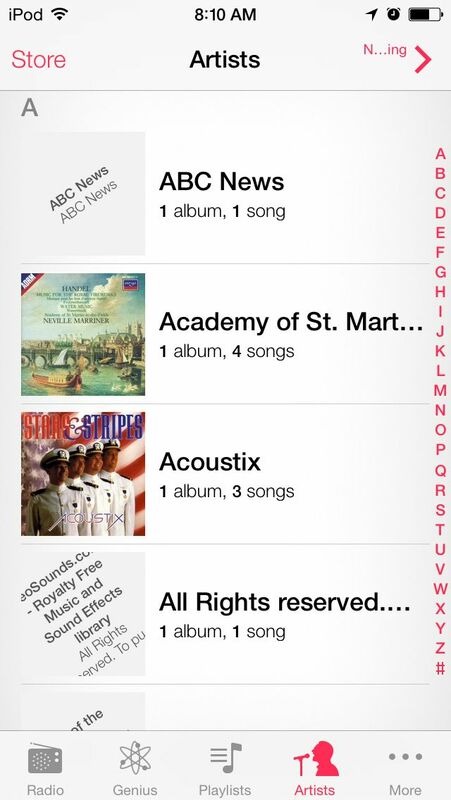 Order the sections to be familiar to old users, or at least make it customizable like Safari. The messages, reputation, and network tabs have switched sides, and merged with the users section. My workflow depends on moving my mouse to the top-left, and I'd like it to stay that way. The home button stays where it was. The tabs slide over to the right. The account info slides over to the right. 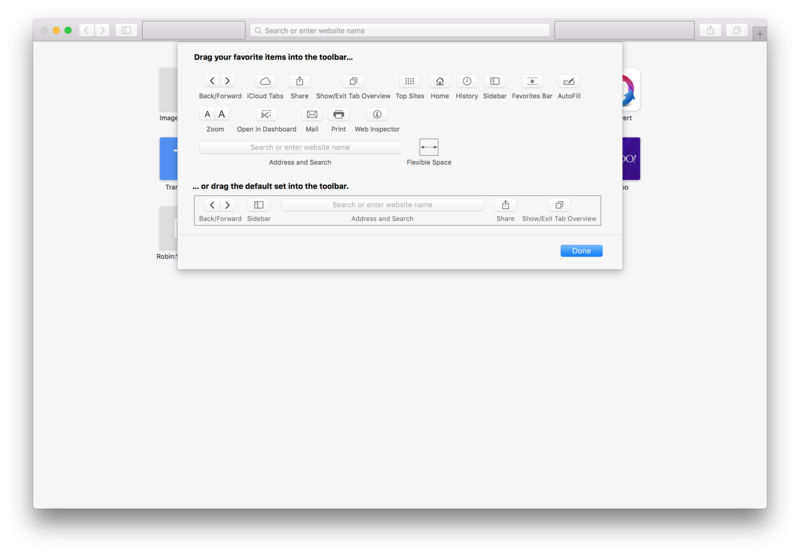 A lot of browsers allow you to control your navigation strip, most notably Safari. The concept would be the same, but the home button would be locked to its position in the screenshot. Also, this would work per-network user so that it doesn't change across sites. Very small nitpick, but when I click one of the logos on the right side, a menu opens. If I then move my cursor horizontally to another logo, another menu opens and the previous one closes. This works for notifications, achievements and the list of communities, but not for the help menu, although it still has a menu. The reverse doesn't work either: opening the help menu and then moving the cursor horizontally will do nothing. Can you please make sure this doesn't float on mobile? I can't understand why web designers think that trend is a good idea. All it does is trade like 25% of the already cramped screen real estate (especially in landscape mode with the keyboard out, made worse by browsers that insist on showing their address bar when you're typing) for the ability to avoid a couple quick swipes down (gasp). 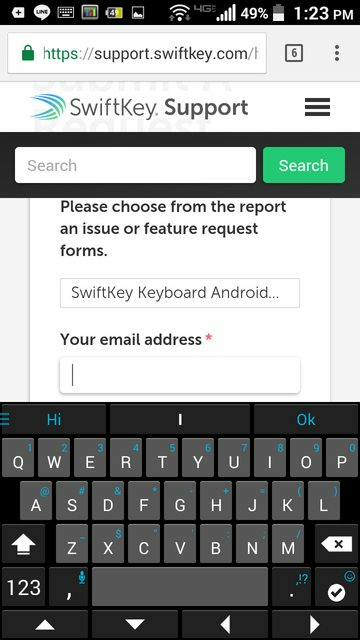 Nothing worse than trying to type in a text field that you only get to see like a 30 pixel high sliver of, or being forced to switch to the tiny one-handed portrait mode keyboard just to see what you're doing. Not all of us carry an iPad around in our pockets as a "phone". If you must float the nav bar (which I assume you'd do because the web devs have convinced themselves that it's cool and modern), at least make it do it selectively based on screen size. I haven't actually seen it first hand on a mobile browser yet, so I'm not sure if it floats (I hope not), but if it doesn't, I want to preemptively take a stand against frustrating UX before you get any ideas. The thing that bothers me most about this new navigation is that the boxes separating "Questions" "Jobs" "Documentation", etc. are not all the same width, and are separated by oddly-spaced gray bars. It would look much better if there was some sort of equality between them, or maybe if the gray bars were removed. First and foremost, it's too large. roughly double the height of the old bar, and for little reason. None of the text size dictates it to be so tall, it just sort of is. It's sticky. There are other comments about this, too. I'm not on a small laptop screen, but I already have my web browser tabs and URL bar. Some people presumably also have browser menus above. 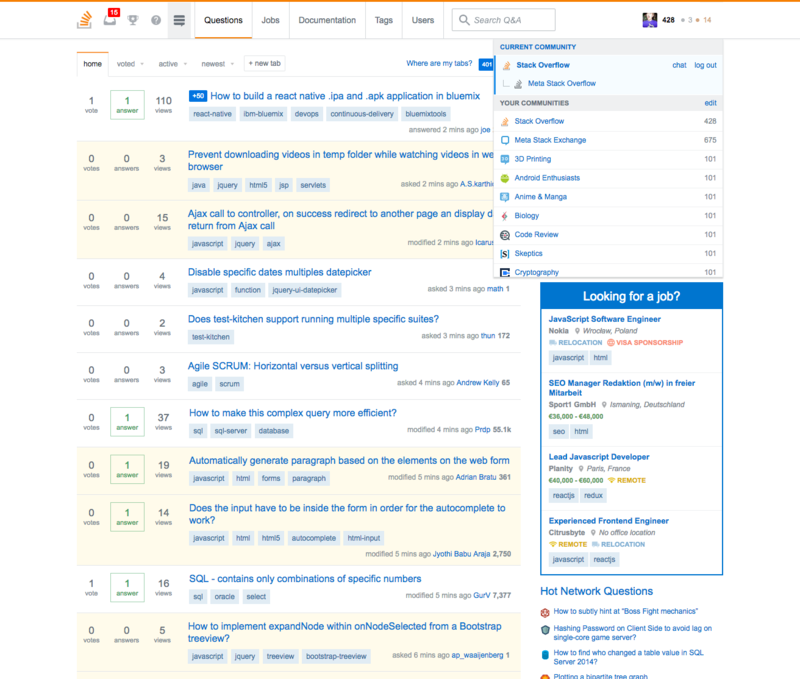 The new sticky nav bar removes another layer of what could be page content. There's nothing on the nav bar, old or new, that needs to be accessed so immediately. 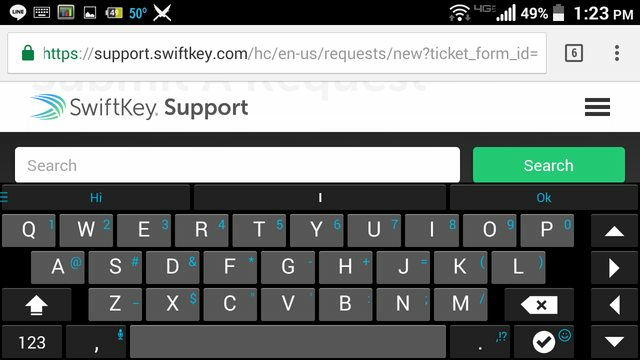 On a mobile device, it's understandable, but computer users generally have a home key. Lack of contrast. The old bar is (at least by default) black on a white page. This makes it easy to quickly differ it from page content. It's also quick to locate when you pop-back up to access it, which works well with it not being sticky. This only showed up in my work's computer which was FullHD monitor, in my notebook which is 1366x768 i still seeing the old bar. You can no longer reach the Documentation review queues from this navigation. The link to review proposed changes has disappeared. There is an HTML and/or CSS bug causing the following issue with the display toggles and add question button; I am using Chrome on Windows 10. The site switcher menu is a bit awkward to use, it's easy to accidentally hover the review queue icon. One option is to swap those around, but I'm not convinced it'd be the best solution. Another option is to move it to the right a bit when the browser's viewport allows it, but I'm not sure how tricky this would be to implement. My top navigation bar is gone, 1 day after I first saw it. I havent turned it off manually. Is testing already over? I thought it would go for 1-3 weeks. Do you have all the data you were hoping to collect during the testing? Noooooo-oo-oo-o-o-o do not make it WHITE, please! I absolutely hate this, mainly because of the bar that won't scroll away. Is there any way to go back to the old interface? I got the new navigation but is there a way to switch back to old nav? I really didn't like the new navigation design for the obvious reasons stated on other comments. A good addition would be to have the navbar stationary on the top of the screen rather than scroll. Especially handy for people on macs and mobile devices without proper scrollbars allowing them to rapidly return to the top of the page. 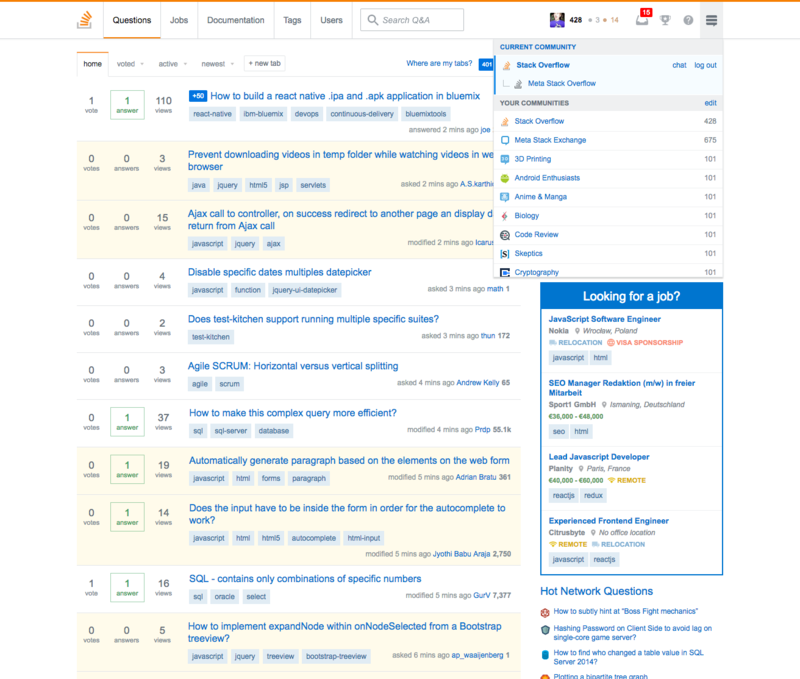 What happened to the top bar design on Stack Overflow? 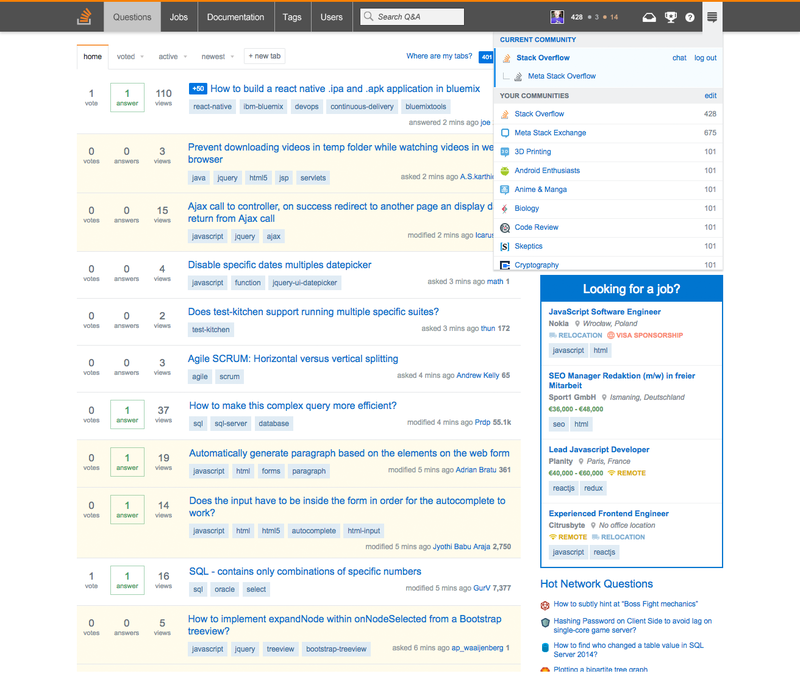 Is there a new theme being trailled for Stack Overflow?